Last night’s debate in the Greek Parliament and the vote in the Parliament at 2 a.m. this morning [16 July 2015] move the Greek financial crisis to a new stage, but they hardly bring it to an end. For the past week, I have been suggesting small but emotionally significant ways of showing solidarity with the Greek people during this crisis. This morning I want to suggest reading some books by Greek writers or books about Greece. I imagine many tourists bring novels and blockbusters with them to read on holidays, and few tourists in Greece probably get further than thumbing through a guidebook when it comes to reading about Greece. Perhaps the erudite among them may also bring a translation of a classical work, perhaps Homer’s Iliad or Odyssey or even a play by Euripides. Yet some of the most beautiful descriptions of Crete that I first read were by Nikos Kazantzakis is his Zorba the Greek. The travel books by Patrick Leigh-Fermor, recounting his travels through Greece, are works of modern literature too. 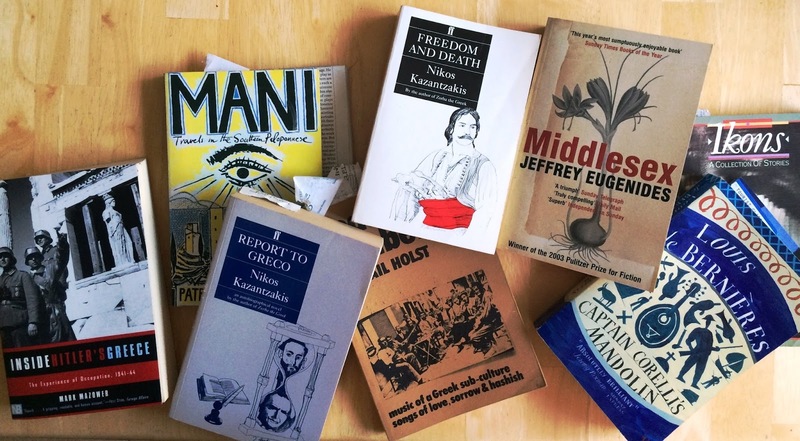 Many Greek works of fiction are also available in English-language translations, and many history books are a good guide to how events of the past have shaped Greek politics, thinking and values today. I am not setting out to provide a comprehensive guide to contemporary Greek literature or books about Greece. But this morning I offer a selection of books that might be worth looking out for during these summer weeks, particularly if you are planning a holiday in Greece and would like to go beyond the package holiday experience. 1, The novel Captain Michalis (Καπετάν Μιχάλης), known in England as Freedom and Death was written in 1953 by Nikos Kazantzakis (1883-1957). It is one of the last books by the author of Zorba the Greek (1952) and Christ Recrucified (1954) – The Last Temptation (1960) and Report to Greco (1964) were published posthumously. This book takes its name from his father, Michalis Kazantzakis. It is a modern Iliad set in Iraklion (Megalokastro), telling in a fictionalised form the story of the struggle between Greeks and Turks, between Christians and Muslims, in Crete in the 19th century. This epic is notable for using many Cretan Greek words and idioms, and the book made these widely known to other Greeks. 2, Pandelís Prevelákis (Παντελής Πρεβελάκης), The Tale of a Town: Since the 1980s, I have been a regular visitor to Rethymnon in Crete, the best-preserved Renaissance and Venetian town in Greece. It is a university town and is known for its literature and arts. Its story is recorded in The Tale of a Town by Professor Pandelis Prevelákis (1909-1986), who was quoted by Ernest Hemingway. Prevelákis was a friend and agent of Nikos Kazantzakis, and wrote a biography of his fellow Cretan writer. In 1938 he published his best-known book, Το χρονικό μιας Πολιτείας (The Tale of a Town), a nostalgic depiction of Rethymnon from 1898 to 1924. Prevelákis died in Athens in March 1986 and was buried in Rethymnon in the churchyard near the top of the hill on Kazantzakis Street. His statue stands in front of the City Hall in Rethymnon. 3, Farewell to Anatolia by Dido Sotiriou (Διδώ Σωτηρίου) (1909-2004), a Greek novelist, journalist, and playwright was first published in Greek in 1962 as Ματωμένα Χώματα (Bloody Earth) and in later English editions as Farewell Anatolia. This book tells the traumatic story of the Greek-Turkish population exchange in the 1920a and the expulsion of Greeks from Asia Minor. Sotiriou explains her novel is based on the memories of a farmer, Axiotis Manolis, who was an eyewitness to the events, and the book is written from his perspective in the first person, set in the Anatolian town of Şirince, in the mountains above the popular beach resort of Kusadasi. The book has been reprinted 65 times in Greece and translated into six languages. It remains popular in Turkey, probably because, as the author says, “there are no evil Greek and Turk, but only people who are victims and pay dear for it.” It also provided have provided not a little inspiration for Birds Without Wings (Secker and Warburg, 2004), the prequel to Captain Corelli’s Mandolin by Louis de Louis de Bernières. 1, Eurydice Street: A Place in Athens by Sofka Zinovieff (Granta, 2005) is by a writer who fell in love with Greece as a student, but little suspected that years later she would return for good with an expatriate Greek husband and their two young daughters. This book is a fresh, witty, entertaining and inquiring account of life back in Athens, as her family come to grips with their new life and identities, the children start school and learning a new language, and Sofka’s husband, Vassilis, comes home after half a lifetime away. Sofka resolves to get to know her new city and become a Greek citizen despite a labyrinthine process of Byzantine complexity. She discovers how memories of the past haunt the present in its music, poetry, and history. She is also the author of The House on Paradise Street (Short Books, 2012), which tells the story of Antigone Perifanis returns to her old family home in Athens in 2008 after 60 years in exile to attend the funeral of her only son, Nikitas, who was born in prison. We are invited into story of a complicated web that rekindles a bitter family feud, with the heart-breaking story of a young mother caught up in the Greek Civil War. This is a story of love and loss that takes us through the war-torn streets of Nazi-occupied Athens and into oppression under the colonels, and to the troubled city of recent times. Appropriately this book is a reminder of what happens when ideology threatens to subsume our sense of humanity. 2, Inside Hitler’s Greece: The Experience of Occupation, 1941-44 by Mark Mazower (Yale, 1995/2001) tells the story of the German invasion of Greece, followed by four years of hideous barbarism. This book explores the impact of the occupation on the lives and values of ordinary Greeks and paints vivid portraits of resistance fighters, black marketeers, teenage German conscripts, Gestapo officers, women who became breadwinners and children who took up arms. Under Nazi Germany, Greece became a bleeding and suffering nation of ruined villages, abandoned Jewish homes and starving islanders. Professor Mazower’s book is a sharp antidote to the sometimes romantic portrayal of war-time Greece that often captivates yet risks merely entertaining the reader of Captain Corelli’s Mandolin by Louis de Louis de Bernières (1994) and its movie adaptation. The moral complexities of life under foreign rule were followed by the political tragedy of the civil war that tore Greece and Greeks asunder. This was neither the first nor the last time that Greece suffered economic exploitation. It caused famine and brought about the disintegration of an entire society. We cannot hope to understand Greece today and the attitude of ordinary Greeks to Germany today without facing the bitter, stark reality of these experiences. Mazower is also the author of Salonica, City of Ghosts: Christians, Muslims and Jews 1430-1950 (Harper Perennial (17 Oct. 2005), a less successful attempt to tell the story of Greece’s second city and that sometimes reads more like dramatic fiction than the history of a beautiful city with an enchanting past. 3, In The Island, Victoria Hislop tells the story of Alexis Fielding who leaves London to find out about her mother’s past in Crete. Sofia gives her daughter a letter to take to an old friend, and Alexis is led to the tiny, deserted island of Spinalonga, the former leper colony. Then she finds Fotini, and at last hears the story that Sofia has buried all her life: the tale of her great-grandmother Eleni and her daughters and a family rent by tragedy, war and passion. I found Victoria Hislop was more successful in telling Greek stories – and more convincing than Mark Mazower in telling the story of Thessaloniki – in The Thread (Headline, 2011). This is an epic novel set in Thessaloniki and spanning almost 100 years, a story of friendship and love that endures through catastrophes and upheavals in the 20th century, from the great fire in Thessaloniki to Nazi brutality, to the Civil War to economic collapse, a thread that continues to weave its way through Greek life today. 5, On Monday, I suggested eating out in a Greek restaurant as a way of showing support for your local Greek community and listed Greek restaurants in places I know, including the greater Dublin area, in towns near Lichfield, in Cambridge, Broxbourne and London. 6, On Tuesday, I offered a collection of my photographs from Greece that could be used as Blog banners or cover photographs for your Facebook page. 7, On Wednesday, I put forward the idea of watching some Greek movies.